This popular handheld worklight is tough with a weather and shock resistant rubber housing and is suitable for outdoors as an extra light on a campsite, in the workshop, on site, in a boat or anywhere else that illumination is required.Ideal for the outdoors, camping, tradesmen or the workshop. 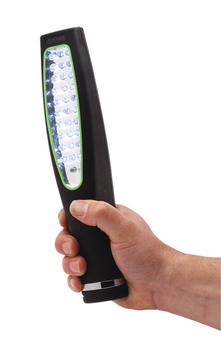 Our rechargeable LED Cordless Ultra-Light features up to 10 hours continuous light! 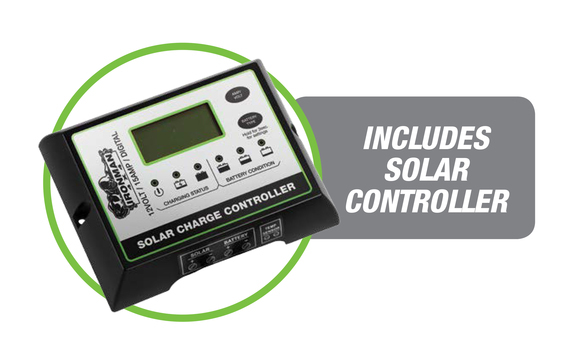 Supplied with a 240 volt desk top or wall-mounted charger, plus a 12 volt adaptor for re-charging in your vehicle when mains power is not available. 30 ultra high intensity LEDs will supply up to 10 hours continuous light when fully charged. 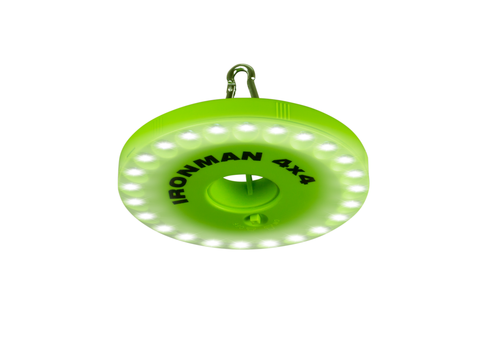 The Ironman LED diodes do not emit UV light and so are invisible to most insects ensuring you are not joined by a swarm of mozzies! Have you ever been camping and found that you didn’t have any hands left for a torch when carrying food and drink to the campfire? Or perhaps you have had to do some repair work on the side of the road in the dark and needed both hands for tools and parts. Or you have needed to recover a vehicle where you have to drag a winch cable up a steep hill requiring the occasional all-fours mode of climbing.94 Lumens LED head lamp. Comfortable adjustable head straps. Wave your hand in front of the light to turn on or off. A great camping accessory or gift idea! Batteries included. 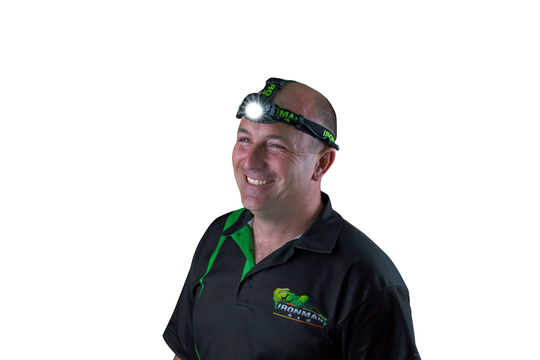 The Headlamp is a great alternative to a hand held torch, leaving your hands free for carrying or working or climbing whilst always shining in your field of vision. This Headlamp has the added advantage of a sensor function for on and off. Simply wave your hand in front of the sensor to avoid blinding a friend coming towards you, and back on again so you can see where you are going. 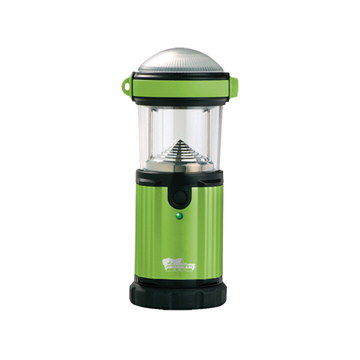 A handy battery powered lantern suitable for up to 25 hours continuous use. Great for camping, or additional outdoor lighting when needed at home. 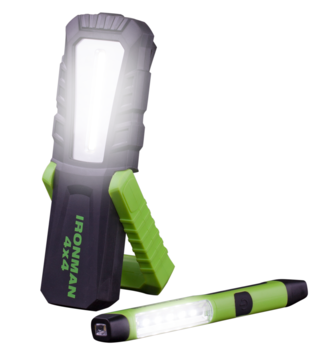 Supplied with batteries a carry strap and a carabiner, this light has the following features 180 Lumens max output power provides up to 25 hours continuous usage. 3 mode operation – high/low/flashing. Water resistant with a compact lightweight aluminium body. There’s no need to sit there in the dark! A great camping accessory or gift idea. 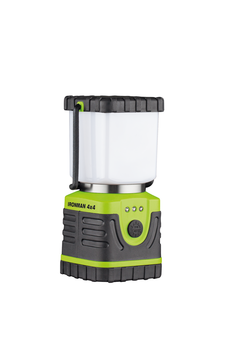 Ideal for camping, or additional outdoor lighting when needed at home, the Ironman 4×4 LED Lantern offers 320 lumens and 80m beam distance of white light. It can function as a carry lantern, or an area light using the integrated hanging hook and removable lid. Also included in the features is a flashing S.O.S function on both white and red light options. Can be used as both a carry lantern, and an area light by hanging with integrated hook and removable lid. The LED Sensor Head Lamp is a great alternative to a hand held torch, leaving your hands free for carrying, working, or climbing whilst shining light in your field of vision. Comfortable adjustable head straps hold the light in place. 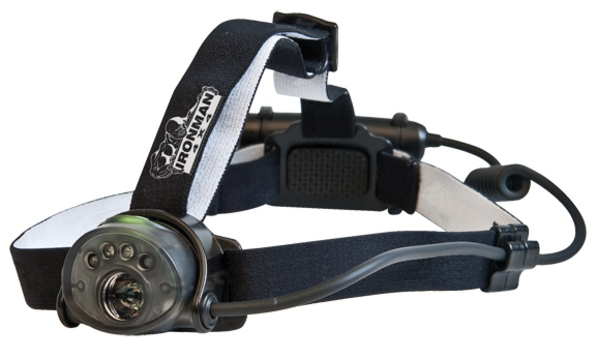 The LED Sensor Head Lamp offers various lighting options – Solid with 3x brightness options. 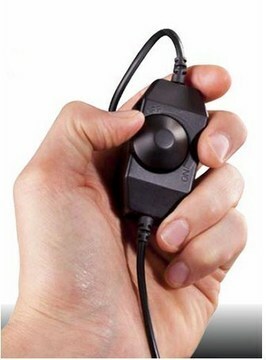 Sensor, simply wave your hand in front of the sensor to turn the light on and off. Flashing, plus a red rear light in either solid or flashing options to help you been seen, in the dark of the night. The new Ironman 4×4 12V LED light strip is a multi-functional, low power lighting solution for all those times you need a little extra light when out in the scrub. With 3m of wire, it’s easy to locate the LED Light Strip in the ideal location around your vehicle and with its IP68 rating you can be assured that it will provide light even in the harshest conditions. The 12V LED light strips come standard with all Ironman 4×4 awnings, providing all the light you need to work without cluttering up the place with lanterns on bench space and can be bought separately for other applications. 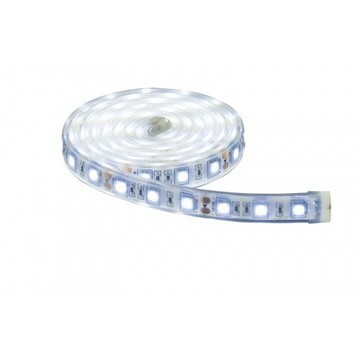 These LED strips are great for lighting up areas such as the back of your ute tray, boat or caravan, in your engine bay or the boot of your vehicle. With the adhesive strip on the back it can be easily mounted to most surfaces. Being an LED strip, the power draw is minimal ensuring that you can have a well-lit camp for nights on end without worry. 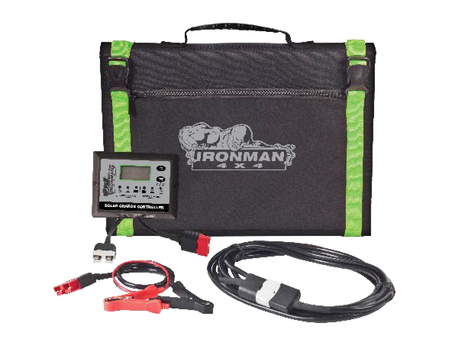 To accompany our led light strips, Ironman 4×4 is now releasing an LED Light Strip Dimmer. Used to adjust the brightness of your LED Strips, Ironman 4×4’s dimmer provides you with more control over the intensity of your lighting from your LED Light Strips. Perfect for providing a more comfortable, less intense light that can be used to relax around without taking away from the ambiance of your campsite and fire. The dimmer is compatible with both the LED Light Strips in our Instant Awnings and the LED Light Strips that we sell separately. 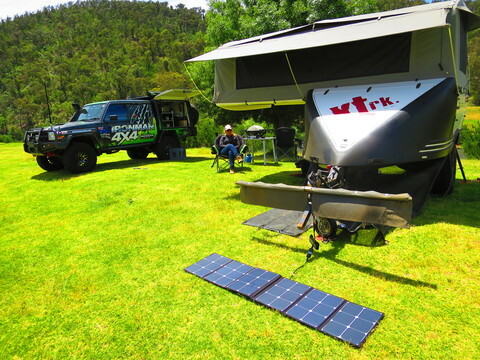 The dimmer is an inline adapter that can be added to any ironman 4×4 LED light strip product without modification, helping perfect your camping and 4wd setup. 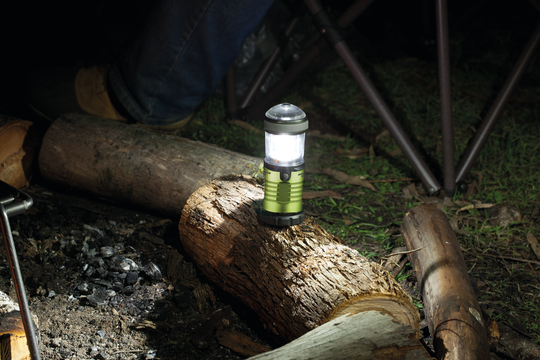 A handy battery powered lantern or torch with a quick twist. 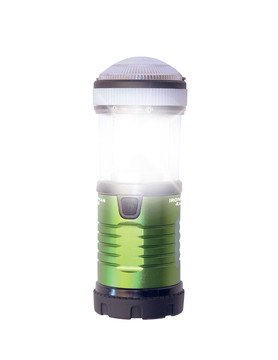 The Ironman 4×4 Mini LED Lantern offers 200 lumens and an 80mm beam distance of white light. Built tough to last, being water resistant and 1.5m impact resistant. Supplied with batteries, a carry strap and a carabiner this lightweight and easy to carry lantern/torch is a great camping accessory or gift idea. 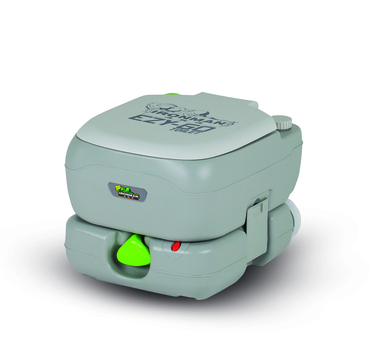 The Ironman 4×4 Bush Toilet is a compact, foldable toilet for camping. It comes in a carry bag and is quick and easy to set up – NO ASSEMBLY REQUIRED. The seat is made from ABS plastic and the stable box design is made from galvanised rust proof steel. The carry bag has side pockets for toilet paper and includes 10 biodegradable bags. 10 pack of biodegradable Bush Toilet bags. Flush-Aid Part A is a flush water additive for the fresh water tank. It keeps the water fresh to ensure better flushing. Flush-Aid Part A leaves a protective film in the bowl and on the valve, and has a cleansing effect. 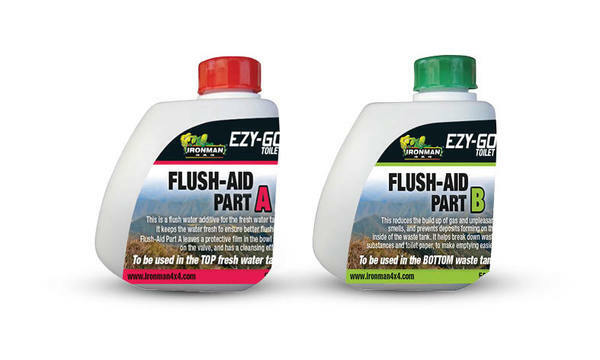 Flush-Aid Part B reduces the build up of gas and unpleasant smells, and prevents deposits forming on the inside of the waste tank. It helps break down waste substances and toilet paper, to make emptying easier. 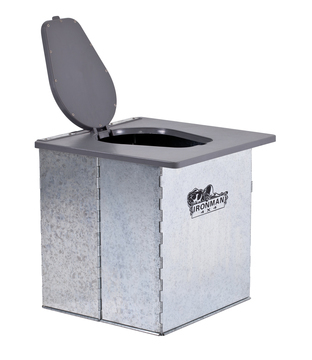 The new easy to use and self contained flushable toilets from Ironman 4×4 are durable, portable, and are easy to empty. 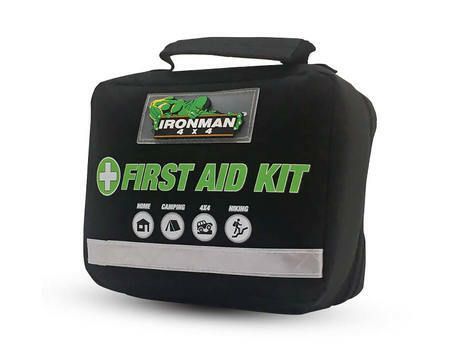 Hygienic and fuss free, these are used in conjunction with flush-aid which is also available from Ironman 4×4, it will assist to keep your toilet fresh, and odour free. 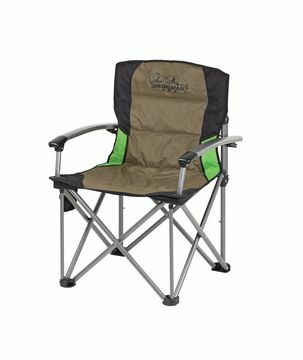 Suitable for both adults and children, having a regular sized comfortable seat, you’ll appreciate this when out in remote areas. 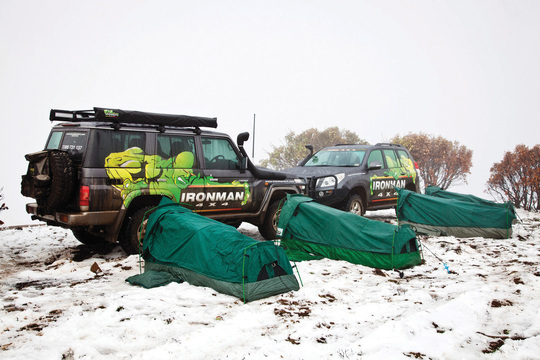 miss the creature comforts of home, Ironman 4×4 has you covered. Buckets are immensely handy things to have when out on the tracks, but there is always the issue of storage. With the collapsible silicone bucket, those issues go away, with the bucket folding almost flat, allowing you to slip into a nice convenient place. Perfect for filling up for washing dishes, using as the supply of water for your re-chargeable camp shower or carting around some fish when fishing. 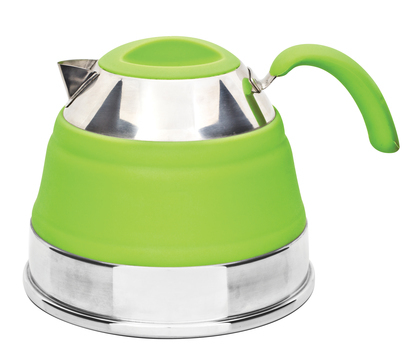 A hot drink on the tracks is an absolute creature comfort, and now you can easily take your kettle with you thanks to the Ironman 4×4 Collapsible Silicone Kettle. With the ability to collapse down to 65mm tall for easy storage, there’s no excuse not to pack it. Tubs are immensely handy things to have when out on the tracks, but there is always the issue of storage. With the collapsible silicone bucket, those issues go away, with the bucket folding flat, allowing you to slip into a nice convenient place. 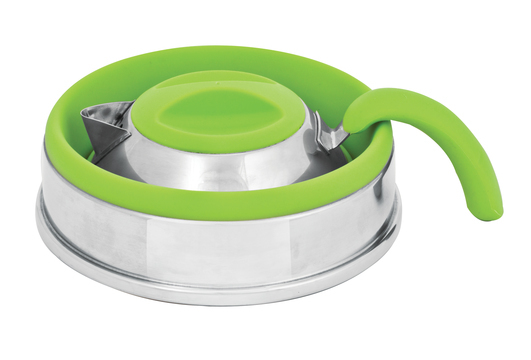 Perfect for filling up for washing dishes or using as the supply of water for your re-chargeable camp shower. A backpack with adjustable shoulder straps, incorporating an insulated aluminium wine cooler this is an easy set to throw in the back of the car to ensure that you and 5 other people can eat in a civilized manner when out of a day or a month. The Deluxe Lounge Chair opens and closes in seconds with a smooth gliding motion and includes a carry bag for easy portability and storage. A strong steel frame construction, stabilising flat feet and a soft but durable heavy material will guarantee the Deluxe Lounge Chair will last you for many years. The Deluxe Soft Arm Chair is the place to be after a long day behind the wheel. King size for comfort, with all the extras you could want. The Deluxe Soft Arm Chair opens and closes in seconds with a smooth gliding motion and includes a carry bag for easy portability and storage. A strong steel frame construction, stabilising flat feet and a soft but durable heavy material will guarantee the Deluxe Soft Arm Chair will last you for many years. 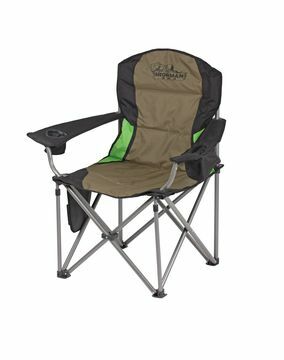 With a 130kg weight capacity the Mid Size Low Back Camp Chair is a great chair for adults and children. Sit back and watch the show at festivals and events or use around the camp fire. 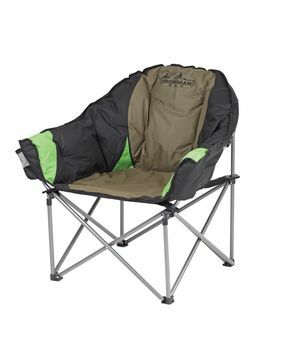 The Mid Size Low Back Camp Chair opens and closes in seconds with a smooth gliding motion and includes a carry bag for easy portability and storage. 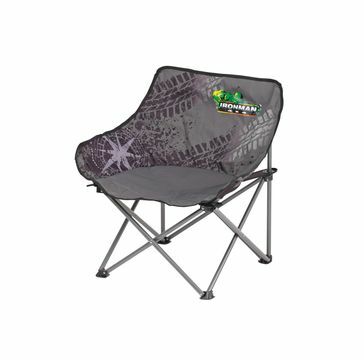 It is a perfect chair for kids to set up while the tent is being pitched. A strong steel frame construction, stabilising flat feet and a soft but durable heavy material will guarantee the Mid Size Low Back Chair will last you for many years. 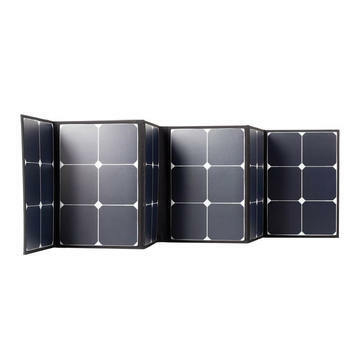 Using the very latest development in Solar Cell technology, The Ironman 4×4 black solar cells are 22.5% more efficient than most other cells on the market. More efficiency deliveries more Amp hours into the batteries. 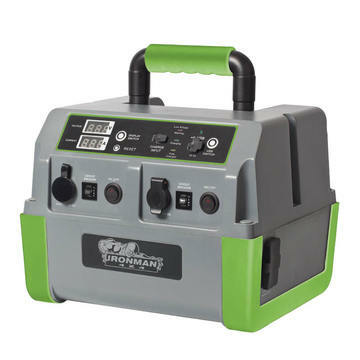 Ideally suited for camping, four wheel driving, caravanning, boating, and other outdoor activities to power a range of 12V DC accessories directly from your 12V DC battery. Everything needed to charge your battery is included, except the sun! This enables you to charge your mobile phone, tablet, laptop and also provides enough power to run your 12V DC portable fridge and lights. 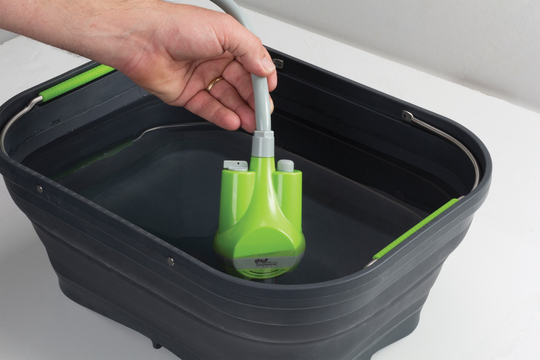 With the robust case and integrated handle, the Portable Power Pack can be easily carried around the campsite. 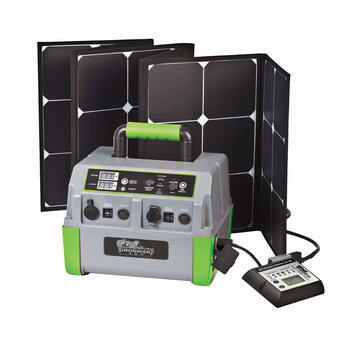 With multiple charging options via AC, DC adaptor and solar panel (not included), the Portable Power Pack will deliver instant power wherever you need it. 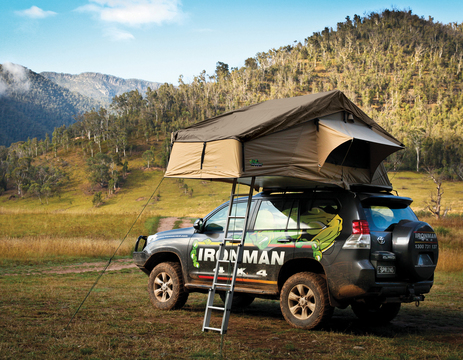 The Ironman 4×4 Roof Top Tent provides the ultimate in ease and convenience when travelling. Unfolding in minutes, a rooftop tent provides sleeping quarters off the ground, protected from the elements. Spacious and comfortable, all bedding can remain inside the tent during the journey, freeing up vital storage space in the vehicle, and allowing the tent to be quickly and easily packed away. 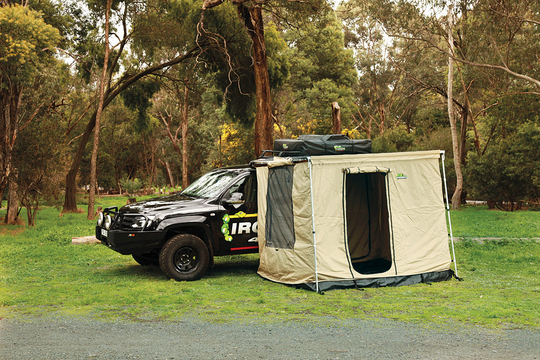 The Ironman 4×4 Rooftop Tent Annex is the perfect addition to the Rooftop tent for those looking for a little extra space. Perfect to use as a change room or even an area for the kids to sleep, the Annex is quick to setup and provides functional, sheltered, ground level space. 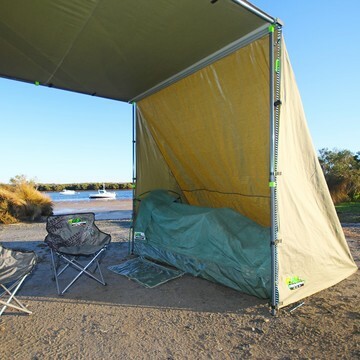 An easy solution to accommodation ‘on the run’ the swag has a long history in Australia – even if your campsite is not by a billabong! This single dome, heavy duty version is manufactured in 320 gsm ripstop canvas, includes insect mesh protection, lightweight alloy poles, a 7cm high density mattress and heavy duty carry bag. This double swag will comfortably sleep two. 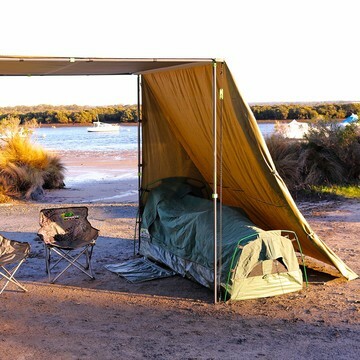 An easy solution to accommodation ‘on the run’ the swag has a long history in Australia – even if your campsite is not by a billabong! This single dome, heavy duty version is manufactured in 320 gsm ripstop canvas, includes insect mesh protection, lightweight alloy poles, a 7cm high density mattress and heavy duty carry bag. 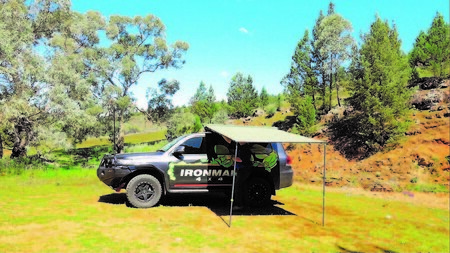 The Ironman 4×4 Awning Xtra is a welcomed addition to the Ironman 4×4 2.5m Instant Awning, providing additional shade and shelter for your next outdoor adventure. 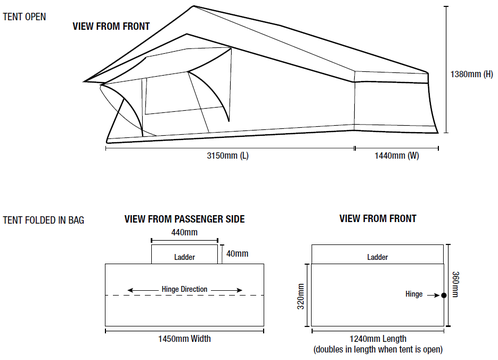 The Ironman 4×4 Awning Xtra simply attaches to the sail track of an awning. 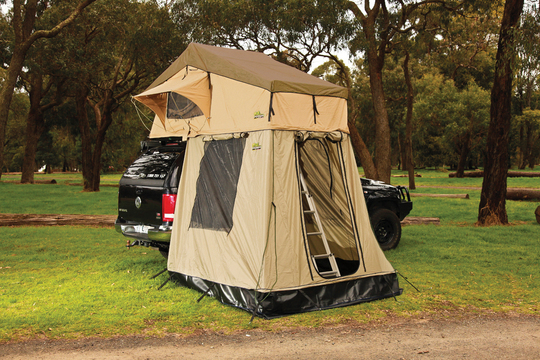 Featuring wrap around wings that fix to the existing upright awning poles creating an alcove, ideal to accommodate a swag to store your camping chairs and accessories under. With side roll up wings it allows for more air flow in hot weather climates. 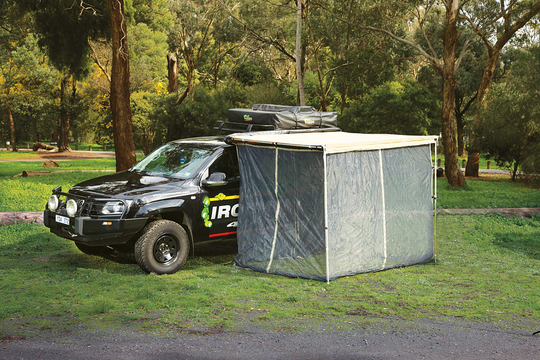 The Ironman 4×4 Awning Xtra can also be used as an extension to your awning using additional poles and guy ropes. Manufactured from a high performance 280gsm rip stop poly cotton fabric and seam sealed stitching, that is not only waterproof, strong and durable, but also provides a UV50+ sun protection rating. Each individual side wing fixing clip and eyelets are heavy duty and gusseted to reinforce the area, reducing any stress on the fabric. 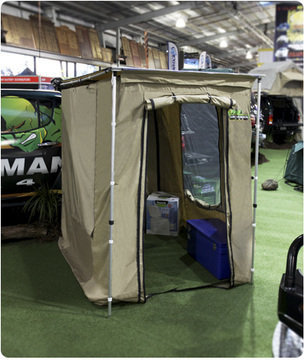 Ground pegs are included to secure the Awning Xtra in place as well as a convenient storage bag. The Instant Awning can even be combined with a Mosquito Net kit to provide even more protection! The Instant Awning can even be combined with a Room Enclosure kit to provide even more protection! 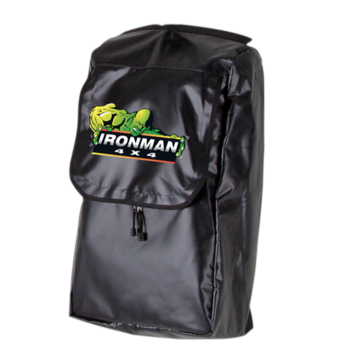 The Ironman 4×4 Swag Bag is flannel lined to ensure you are warm and comfortable when out camping. After a long day of off-roading, fishing, hiking or kicking back around the camp, this swag bag will ensure you have a great night’s sleep. Ideal for in the swag, tent or on a stretcher, this versatile swag bag is a large size, so there is plenty of room to roll around without tangling up or zip two bags together to make a double sized sleeping bag. 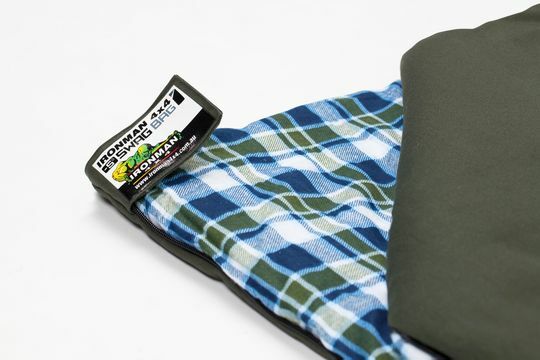 Manufactured from dual layer 360gsm lofty hollow fibres with inner baffles, and a 300gsm 100% cotton outer, with cotton flannel lining; this will breathe whilst keeping you warm which can assist to prevent perspiration, allowing for restful sleep. Integrated tensioning buckles and carry bag allow for quick and efficient roll up storage for when you’re on the go. A handy, large, heavy duty bag, useful for any outdoor activity. With a water resistant coating you can throw in all those wet or muddy clothes & shoes keeping them safely stowed until you hit home or a camping ground with a laundry! 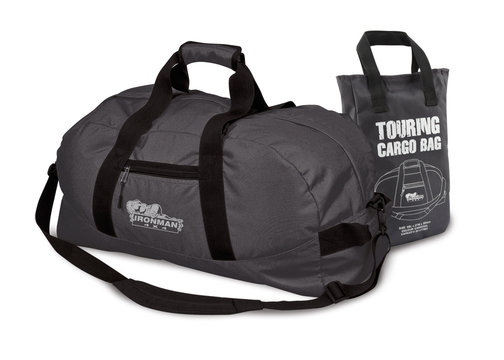 50L Cargo Bag features double carry handles with velcro strap, padded shoulder strap, heavy duty zip and side pocket. Perfect for the weekend getaway. Not only does Ironman 4×4 help you set up your vehicle for travelling, we can now help you plan and map your trips. 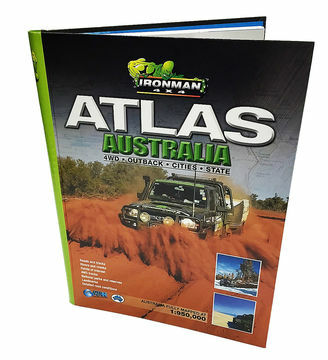 The Ironman 4×4 Atlas Australia is a large hard covered, spiral bound book using Westprint quality mapping making it very easy to read and ideal for trip planning. creeks, 4WD tracks, points of interest, national parks, reserves, landmarks and detailed road conditions. This Atlas is ideal for the 4WD traveller, the around Australia traveller, caravanners, campers, truckies and anyone else who ventures into the great Australian Outback. 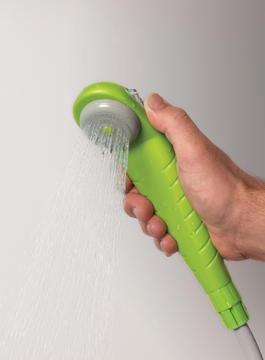 The Ironman 4×4 Eco Pressure Shower isn’t your typical camp shower. There is no electricity needed, no need to hang it overhead and it provides good pressure. The Eco-Pressure shower is driven by pressurising the 12 litre bladder using a dual chamber pump providing stable water pressure. 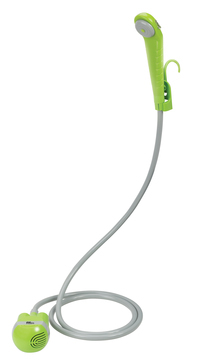 The foot operated pump pressurises the shower quickly and easily. The easy one handed operation provides plenty of freedom in how it’s used and its applications aren’t just limited to showering. 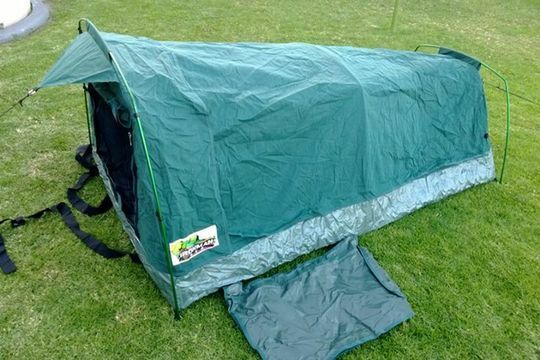 It’s perfect for use camping on the beach, hiking, cycling, rinsing the 4×4 and washing the dog. 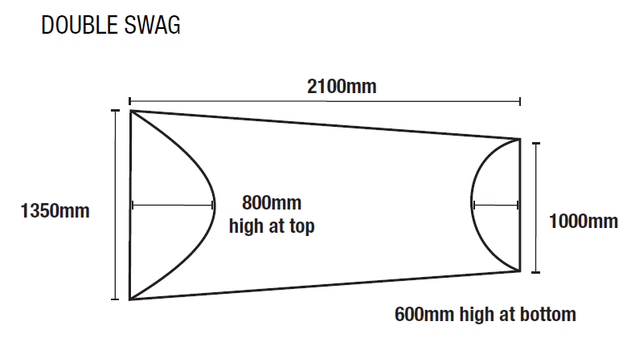 The shower head features a trigger to ensure water is only flowing out when you want it to – maximising water economy. Made from strong and hard wearing TPU material the Eco Pressure shower can handle water temperatures up to 50°C – perfect for a nice hot shower or warm water to use for washing dishes. The included anti-kink hose will ensure consistent flow and fuss free use. The compact carry case has drainage holes for any residual water for when its not in use, and allows the shower to pack up to a very compact form that’s well protected. Built tough enough to throw on the roof rack or in the back of the ute, but stylish enough to take to the 5 star hotel. Built with travel in mind, it is light and compact, but strong as an Ox. The Explorer duffle bag is made from waterproof 1000D PVC with YKK zips and strong webbing handles. The bottom is double skinned for extra protection, so it doesn’t matter if it slides around a bit. 65L of storage, allows you plenty of room to pack and adjustable sides means you can compress the bag to make it a bit smaller. Inside the lid has a small separate storage area for anything you want to keep handy. 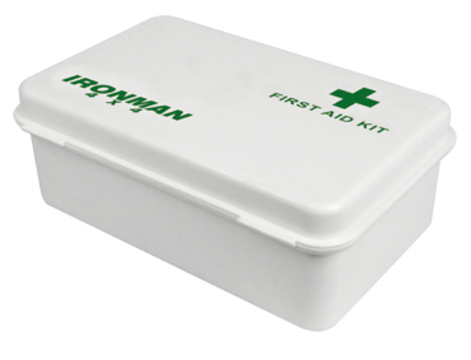 You never know when you will need easy access to a first aid kit either off-road or on-road. Minor injuries can be made much more bearable with immediate treatment, and serious ones can have signifcnatly better long term outcomes with the right actions early. 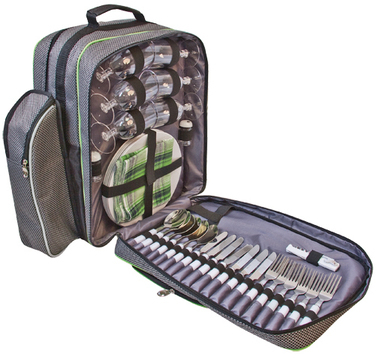 This is comprehensive and reasonably priced kit, neatly packaged and in a compact size allowing for easy storage. It comes in a high visibility case for easy recognition. 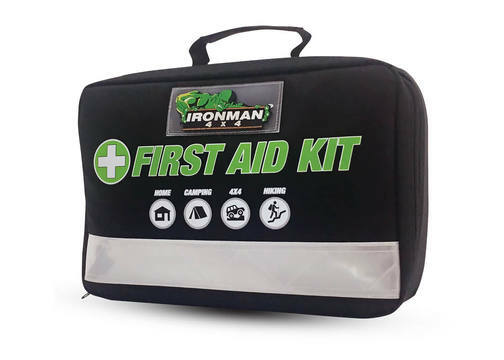 A first aid kit should be standard equipment on any 4WD. Slide it under your seat in case of an emergency. Hopefully you’ll never need it, chances are you will! 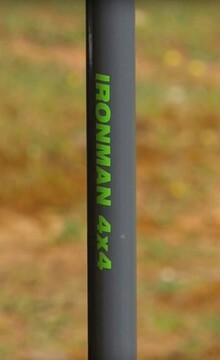 All Australian made, the Ironman 4×4 hand cleaner works to remove dirt, grease and oil as well as regular hand cleaning. With soft silica particles providing some grit in the cleaner, it easily removes ground-in filth and dirt on the skin. 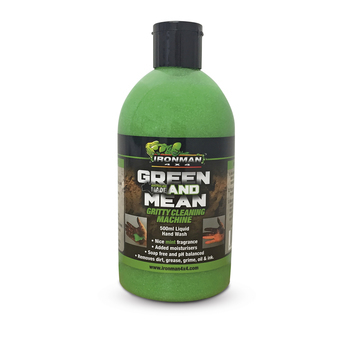 With a built in moisturiser and a nice mint fragrance, this green and mean gritty cleaning liquid hand wash is non toxic, non corrosive, soap and phosphate free. Can be used with or with out water, so it can be used anywhere. 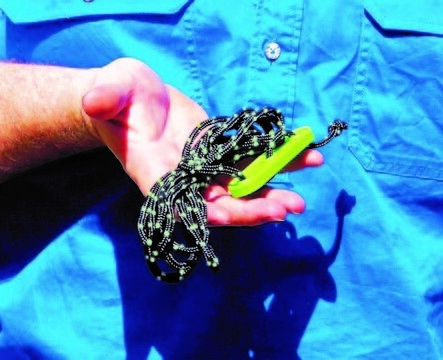 Developed to use at home, in workshops or in the outback. 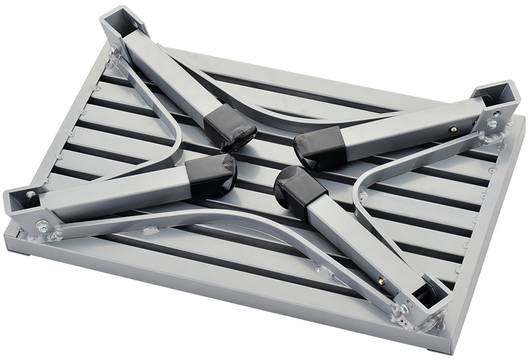 A great portable folding step solution, for trips away in your four wheel drive, camper trailer or caravan, not to mention are also great for use at home or in the backyard shed. 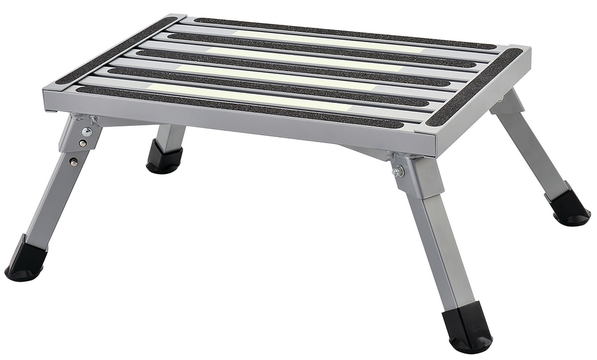 Light weight and folding away to a compact size, makes these very solid stable steps the perfect addition to your camp site set up. Features include non-slip grip tape on tread surface, ideal for wet weather. Glow in the dark tread ensures safe foot placement in the dark of the night. 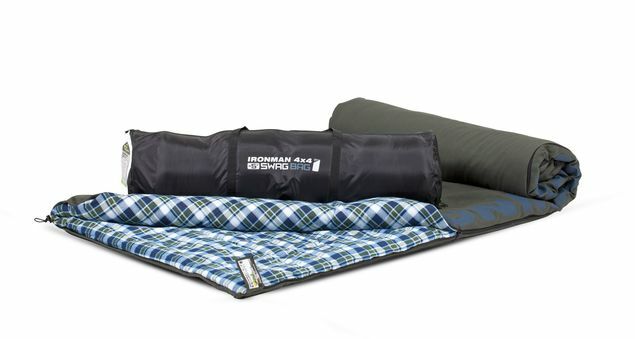 The Ironman 4×4 Quick Fold Camping Step is ideal for a caravan step or when closed can be used as an entry mat to your rooftop tent. 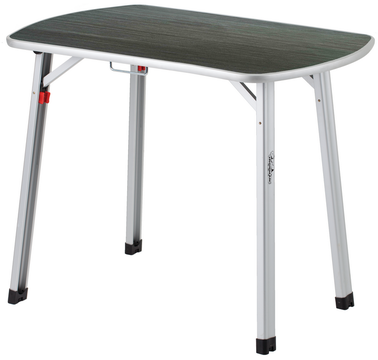 It’s ease of setting up and portability makes the Quick Fold Table the ideal set up for your picnic lunch or your off-road base camp dining table. Built tough from 9mm Melamine coated MDF makes it light weight and durable. Features include; adjustable feet ensuring the table is sturdy on uneven surfaces, quick folding legs makes the table pack flat for easy storage, and a built-in handle means no fuss carrying Carry bag included. Table rated to 50kg. Size: 110cm (length) x 70cm (width) x 73cm (height). 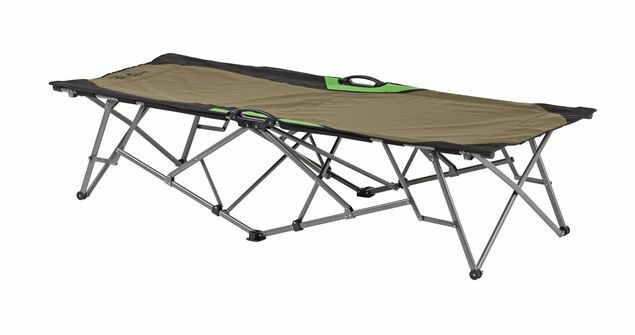 Head to bed for a relaxing sleep on the new quick-fold stretcher. Literally folds out in 2 seconds, this is the quickest fold out stretcher on the market and will easily accommodate your Swag Bag sleeping bag. Try it for yourself, you will not believe how quick and easy this stretcher is to set up, or pack up. Slide into bed with ease, without the need to crawl around on the ground. Strong steel frame construction with soft, durable but heavy duty material will ensure a perfect nights sleep for many, many years. 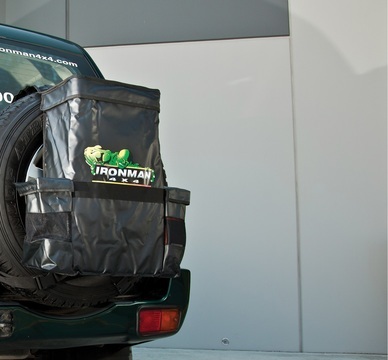 Designed with versatility and maximum storage capacity in mind, the Ironman 4×4 Multi-purpose Rear Wheel Bag is the perfect accessory for any tourer or 4WDer wanting that extra storage carrying ability for rubbish, wet clothing, recovery gear, etc. 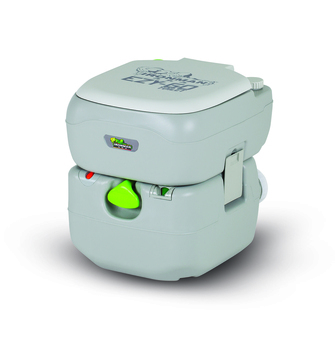 The weather-proof velcro sealed zip flap protects the beg contents from the elements. The vented side pockets are ideal for, and help dry wet or muddy recovery straps, recovery accessories, tools, etc – and have inbuilt drain holes. 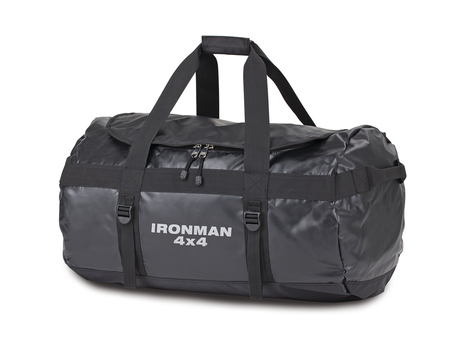 The Ironman 4×4 Rear Wheel Bag has a huge 55L storage capacity, and is strong enough to withstand the rigors of 4WDing. Looking to stay clean and fresh out on the tracks? 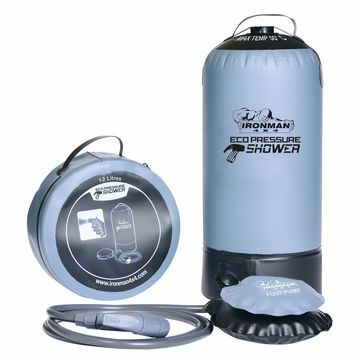 The Ironman 4×4 rechargeable camp shower has you covered! With a built in Lithium-ion battery there is no need to worry about vicinity to your vehicle, you can set this up in privacy anywhere that is convenient to you! 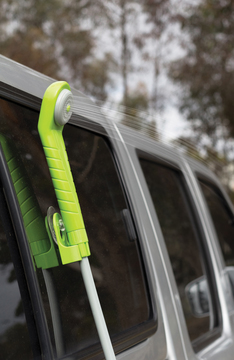 The built in suction cup and hook provide plenty of mounting and setup options. And with up to one hour of run time, you’ll be running out of water before you can run the shower battery down! This handy bag is ideal for keeping your belongings off the ground and easily accessible. Attaching via sail track, the hanging tent bag is ideal for use on roof top tents, awnings or anywhere a sail track is available. Made tough with 1000D PVC fabric, heavy duty stitching and YKK zips. Pull cords are included on the zips to make accessing your belongings quicker and easier. 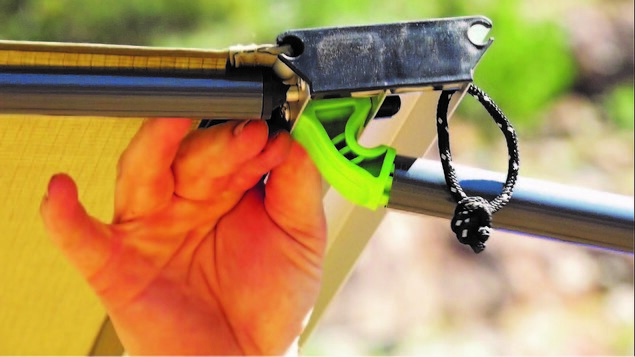 With easy set up and pack up, this is the perfect addition to your camp setup. 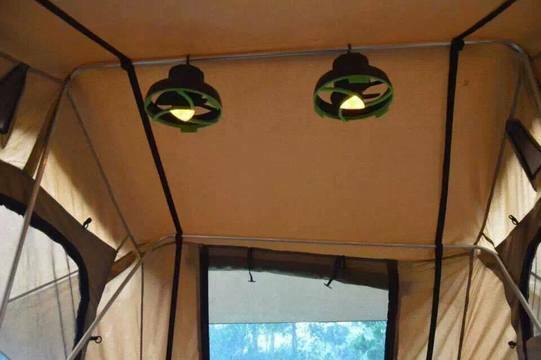 Keep cool in your tent with this two speed fan and LED light. Operates on 4 x D sized batteries (not included) with up to 48 hours run time. 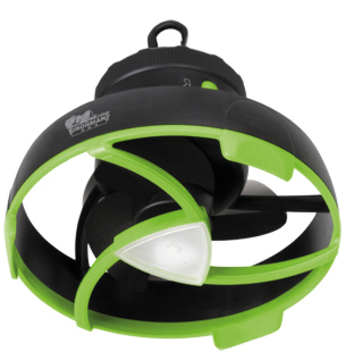 Energy efficient white LED light rated to 50 lumens.A handy camping accessory for summer, this clever battery operated two speed fan incorporates an energy efficient 50 lumen (CREE) LED light. Fan can be operated for up to 48 hours on low or 24 hours on high, light will give you 100 hours plus running time on low setting. 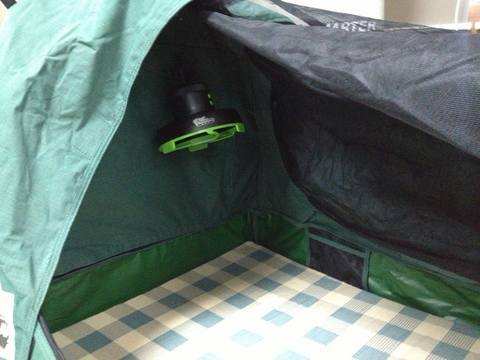 A hook fitted to the bottom of the unit allows fan to be attached to tent frame. 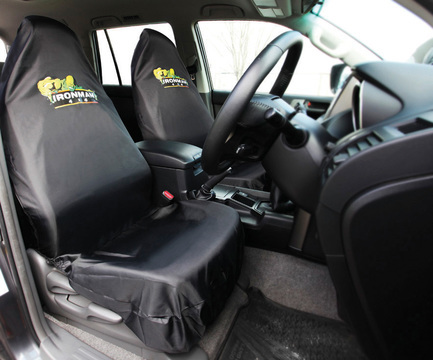 It is easy to get dirty whilst out on the track, so protect your seats with these easy to slip on, universal seat covers. 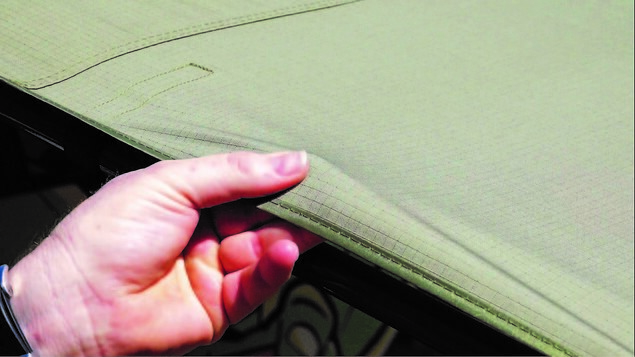 Made of durable fabric designed to give maximum protection of your upholstery. 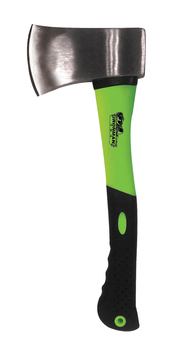 The perfect tool for driving pegs into all terrains, securing your swag, tent and tarp with ease.